After creating your custom web design, we will send you a version that you can view and make comments on. After all of the comments are in, we will make the corrections. Depending on how extensive the corrections are, we will either send you a new version to view or move forward with building the website. We understand that designing a website is a huge undertaking. You want to make sure that everyone is on the same page with the new design. However, the more people that get involved, the longer the process will take. Waiting for several different people to make (often contradictory) comments and changes to the design will extend the timeline for your project and drive our designer crazy. Oh sure, we understand that you want the design to be perfect, but you can save us from going grey early by limiting the number of people involved in the project or assigning a point of contact to the project. The point of contact will collect all of the feedback from the parties involved and consolidate it all. This will streamline the process for us and eliminate most of the confusion. This relatively harmless statement can be the bane of our existence. Often we spend the majority of our project time waiting for the client to send us photos, content, or other information. We know as much as the next person that running your own business is time-consuming. However, we also like to feel that sense of accomplishment when we complete a project. Waiting on clients for weeks or months to send photos over while their project sits there collecting dust drives us absolutely bonkers. To avoid making us pull our hair out, send photos and project materials over as soon as possible. There’s no need to go through the photos and edit them. Simply share a folder of images with Techno Goober on Dropbox, and we can edit them and discuss specific placement later on. When we hear this one, smoke comes out of our ears. The main reason statements like this upset us: What does that even mean? Obviously, our #1 goal as a company is your satisfaction. If you don’t love your website, then we haven’t done our job properly. However, we rely on your feedback to keep the project moving. This isn’t a teenager that has started sneaking beers from the fridge. Provide ample (descriptive) feedback to keep your project on the right path. “We want something fun.” “Be creative!” “Make it pop!” Etc. Pretty much all vague expressions of “we trust you, you’re the expert” drive us a little crazy. There is a huge amount of guesswork on our part already when creating the design. The designer working on your project relies on every little piece of concrete feedback you can provide. Be sure to put plenty of thought and effort into your Client Questionnaire. This will help drive the project. Everything, including your favorite colors, can be useful to our designer. This one makes us audibly sigh most days. It’s our job to stay up to date on new and exciting software, practices, and fun stuff. In fact, it’s one of the most exciting parts of our job. We love watching webinars and reading articles about new stuff on the forefront of our industry. Often times, our team has very strong feelings about why they do or do not do something in a particular way. Also, a particular product may not always be right for your website. Asking if we have “heard of” a product does not always come across in the right tone to professionals in any field. If you have a question about a product or practice, try rewording the question. Try asking our programmers, designers, and SEO experts their opinion on “XYZ” rather than asking if they have heard of it. Not only will this make them feel special and authoritative, they will be more likely to recommend a better product if there is one. As “build your own” websites gain in popularity, we hear this phrase more and more often. A client will come to us for logo design, Facebook management, marketing, or IT services, but they don’t want full website development. This particular client would rather build their own. The first reason, you guessed it, they’re our competition. While an entirely internet-based program for building a website doesn’t seem like competition for our local business, they still provide a similar service. The second reason? Their lack of customer service. That’s the hallmark of our business. We build websites, but we also provide customer service. We help you understand the process of building the website and answer your questions when things go wrong. We’ve never heard of Wix picking up the phone day or night to help fix your website. Don’t build the website yourself. It will take more time on your part. It will only be marginally cheaper, and it won’t look nearly as amazing. 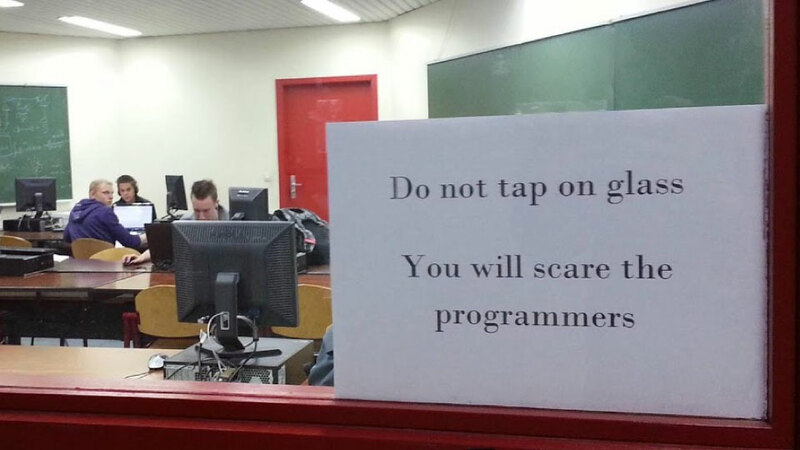 So, don’t upset our web developers and designers. Learn from these mistakes. Trust Techno Goober to design and develop your completely CUSTOM new website. We know what we’re doing after all. Learn more about how long it takes to design a website from start to finish. Hint: you can speed up the process by avoiding the phrases above. Call Techno Goober at 302-645-7177 or contact us online to begin creating your new website. We can also help with social media, marketing services, branding services, and tech support. Refer a friend in 2018 and receive an Amazon Gift Card.